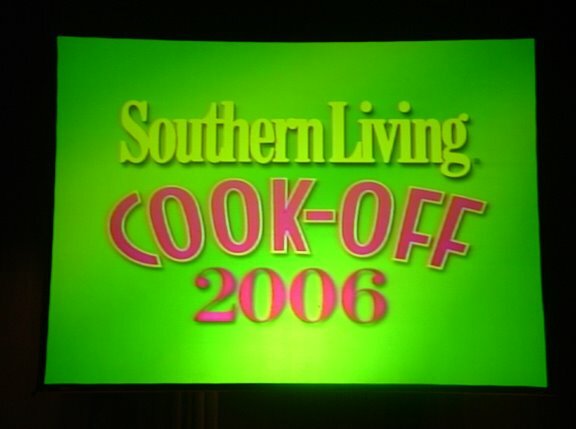 The Southern Living (SL for short here) Cook-off began with a welcome reception and orientation at the Culinary Institute of Charleston, which is part of Trident Technical College. As we ate chocolate-covered strawberries, we mingled and introduced ourselves to each other. 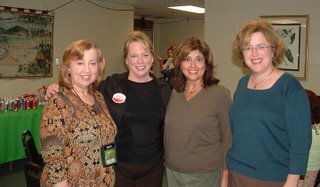 It was fun to meet some people I "knew" from the cooking contest board, such Diane and Olga, who I had seen on the Web site for the Sutter Home Build a Better Burger contest, which was held the week prior to SL. We had a quick orientation, then went to the kitchens to check on groceries and supplies, as well as select our serving dishes. I looked at the assortment of white serving dishes that were laid out on two tables, and was dismayed that I didn’t see a single dish that I could envision serving risotto. I had hoped for a shallow bowl with a wide rim, and there was nothing like it. 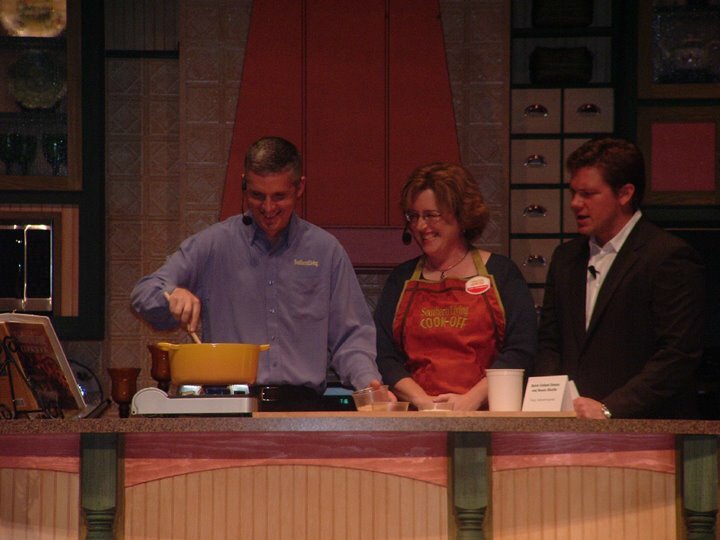 Shannon Satterwhite, SL Foods Editor and my “hostess” for the competition, offered to shop for a bowl that night. I hated to cause more work for her, but I didn’t know what else I could use. Those of us with early times gathered in a hotel conference room for breakfast at 6:30 a.m. on Wednesday. (SL put us up at the Mills House Hotel, a lovely hotel in the middle of the historic district.) At 7, the bus arrived to take us to the culinary institute. When I arrived at the culinary institute, Shannon had a couple of bowls for me to choose from. One was pretty much what I envisioned -- a shallow bowl with a wide rim. Whew! I was relieved to have something that I thought would work. We started cooking at 7:30. Even though my dish is pretty quick and simple to prepare, I actually filled the two hours they had given me. I spent a fair amount of time inspecting each piece in my bag of collard greens, removing any nasty looking little brown things and thick stems. My cooking went smoothly, other than the time I turned my back on the stove to chop some parsley, and turned back to my pot to find a tiny bug floating in the water! I quickly spooned him out, but I’m glad he didn’t find its way to the judges. I was one of three finalists in the “Healthy and Good For You” category. 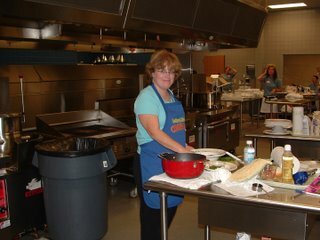 We were given the time of 9:30 a.m. to have our dishes complete and ready for judging. (We were the first category to be judged.) I had been concerned about the timing – if I didn’t allow myself enough time, the brown rice wouldn’t be tender. If I was done too early, the food would be cold and all the creamy broth would be absorbed by the rice. But I timed it about right. I was done at 9:25, took a couple of minutes for plating, and put the dishes on the tray that would go to the judges. Edwina had hers ready at about the same time. Her entry, which had a colorful slaw, looked very pretty next to my brown and green creation. I didn’t get a good look at Ginny’s. 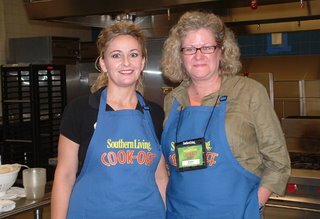 Southern Living staffers took the trays back to the five judges, who didn’t interact with the finalists prior to or during the judging. This seems to be the case at most of the competitions that place a high priority on fairness. 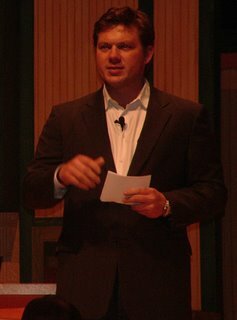 Then it was time to go to the Galliard Auditorium for rehearsals for the show, which would be hosted by Chef Tyler Florence the next evening. We were told that Tyler would introduce each of us, one by one, then we’d go to our designated “kitchen” on the set. We’d join a Southern Living staffer, who was there to help us present our recipes. 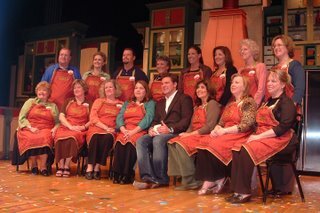 I was in the middle, along with SL Test Kitchen Assistant Director, James Schend. (Woo-hoo, I got the guy...) Once we were introduced, Tyler would go to each contestant’s “kitchen” for a five-minute demo of the recipe. The Southern Living staffer was prepared to do the entire demo in case the contestant wasn’t comfortable talking on stage. James walked me through the demo. We also chatted a bit and I came to find out that James grew up about a half hour from my home town, and even worked at Six Flags Great America, where I worked for six years. That put me at ease with James, and by the end of the rehearsal I was pretty comfortable with the show. On Wednesday night, John Alex Floyd, Jr., the editor of Southern Living hosted a wonderful dinner for us at the Peninsula Grill. I’ll describe the food in detail later, but it was a very nice evening. 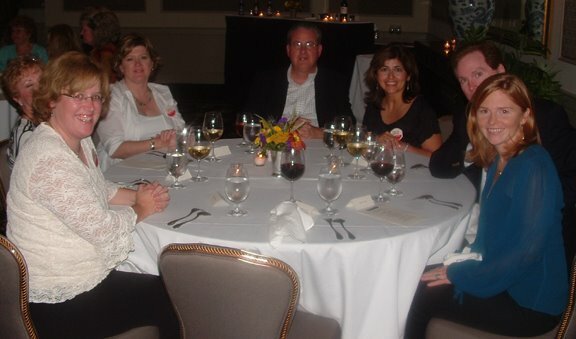 Our table was fun, and included John and Hallman from SL, Olga and her husband, Karen and her mom, Tom and me. 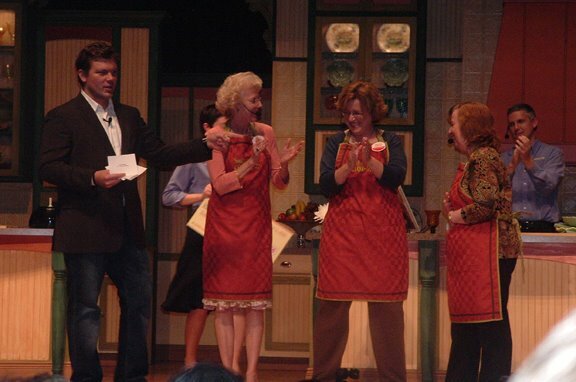 At some point, Karen’s mom started telling me that her daughter was in the Pillsbury Bake-off in 2004. I was, too, I said. Then she said that Karen had been a category winner that year. I was, too, I said, and then it dawned on me why Karen had looked so familiar. She had been one of the three other women on stage with me, sweating over the prospect of a million bucks! Duh! It was funny that neither one of us had recognized each other until then. After dinner, I met Nathalie Dupree, who was one of the judges. I watched Nathalie's PBS show regularly when I was on bed rest during my first pregnancy, and I have two of her cookbooks, so it was fun to meet her. I kicked myself that I didn’t bring along a cookbook for her to sign, but I did get a picture with her (although I don't know why I made such a goofy face in it). On Thursday, a bus picked us up at 3:30 for the drive to the auditorium. When we got there, people were already waiting at the door to get in. We were told that people had started lining at 2 p.m. in order to get good seats. They weren’t waiting to see us – they came to see Tyler. He has quite a female following. (By the way, I've received a number of emails from cooking contesters since I first posted this. Apparently James from SL has a female following of his own!) They told us they had sold about 1,600 tickets in advance, and I believe more were being sold at the door. 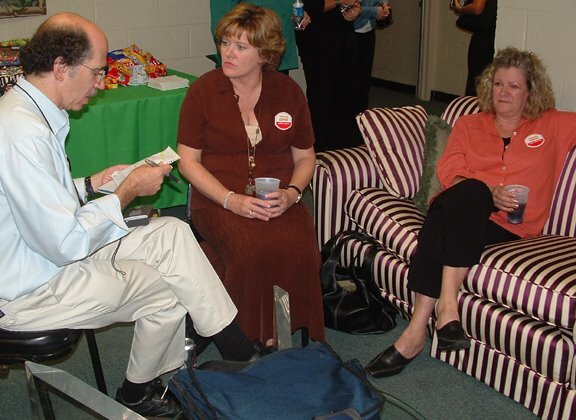 We were taken to the green room (which wasn’t green at all). They had light food set out for us, but I didn’t see much eating going on. 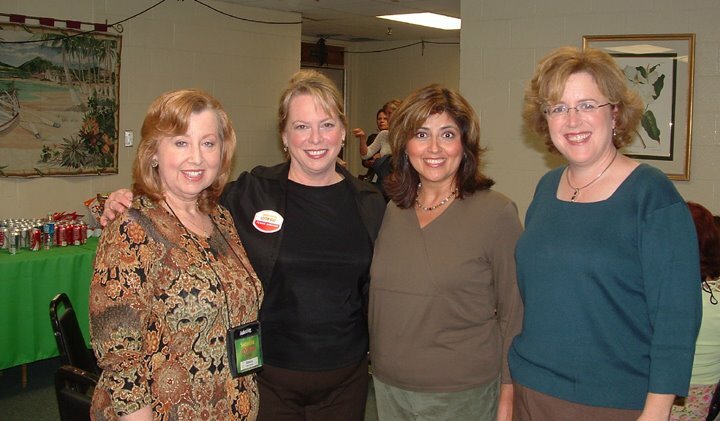 We got our make-up done by one of three make-up artists, and each of us had our photo taken on stage. A reporter interviewed several of us for the Time Warner employee publication (that's Karen and Diane S. getting interviewed). A local TV station arrived to interview Pennie, the contestant from Mount Pleasant, right across the river from Charleston. Finally the show started. We watched the party starters talk about their dishes. Tyler couldn’t get the knack for saying the word flautas – he kept saying fla–OO-tas (clearly, Mexican food isn't his specialty). 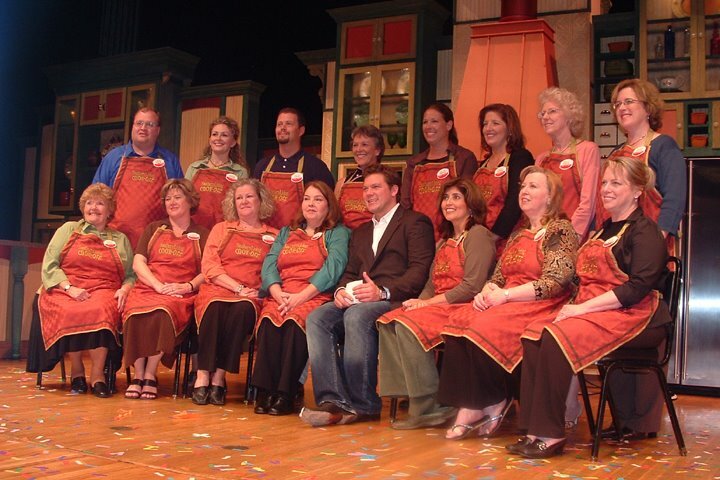 Pennie, the hometown competititor, demonstrated her bisque, which we all agreed looked good. Then came Olga’s bruschetta, which appeared to be the simplest of the bunch. The winners were announced – Olga’s bruschetta! Next came the “Your Best Recipe” category. Right after the finalists were announced, those of us in the healthy category were told to go backstage, where we had our microphones put on, and then it was more waiting. My feet, which were in the only pair of heels I own, started to hurt, so I took them off and stood in my stocking feet as we waited. Edwina seemed to be the most nervous of the three of us. She’s fairly quiet, and going on stage wasn’t something she’d ordinarily choose to do. We heard Mo named winner, and were able to do a few high fives as the people in the category left the stage. 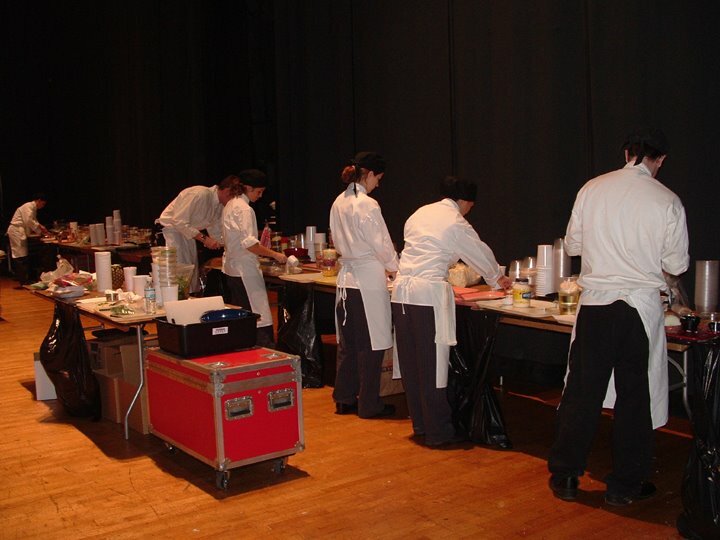 Then they showed a short video of the 15 finalists cooking, set to the song “Walking on Sunshine.” We had to strain to watch it on the TV monitor at the other end of the backstage area, as culinary students scurried around getting the dishes ready for the show, but the lighthearted tone of the video eased our nerves. Finally, Tyler announced us one by one – first Edwina, then Ginny, then me. It’s pretty amazing to hear this person you’ve seen so many times on TV call your name. I walked out, didn’t trip on anything (which had been my nightmare), and walked over to a smiling James. Tyler asked me to tell me what we were cooking and I said it was “Italian comfort food with a healthy and Southern twist.” He went on to describe risotto for the audience. 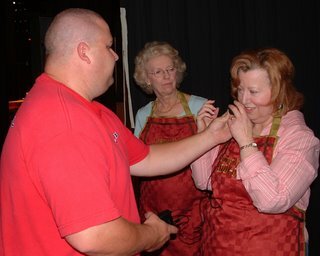 Then he walked over to Edwina for a demo of her dish. Given that she had seemed nervous, I was surprised to hear her talking away on stage. She did great! Ginny was next, and she was a total cut-up. She started by telling Tyler that her grandchildren were big fans of his. “The first ingredient is tequila,” she drawled, and went on from there. She corrected a number of Tyler’s mistakes. She had the audience roaring. “How the heck are we going to follow THAT?” I muttered to James. “We’ll be fine,” he replied. I looked into the pan and drew a total blank. I couldn’t think of what the heck was in there. “... saute onions,” James chimes in. Onions. Yeah, that’s what those are. “...in ENOVA oil,” I say, giving a plug to the brand for which I won a $500 category prize. After that, I was fine. I don’t remember much else, other than enjoying being on stage between James and Tyler. There are worse places for a woman to find herself. I had expected to be distracted by the TV Food Network cameras that were filming the event, but I honestly didn’t notice them while I was on stage. I’ll be curious to see what airs. I knew if the first word was “quick,” I had won. It wasn’t me. But I couldn’t remember whose dish began with sweet, so I didn’t know which way to look. I looked at the floor, then at Ginny, who was applauding for Edwina. Edwina had won! I was truly happy for her, as I had enjoyed getting to know her during the contest. The final category was desserts. They all looked delectable. 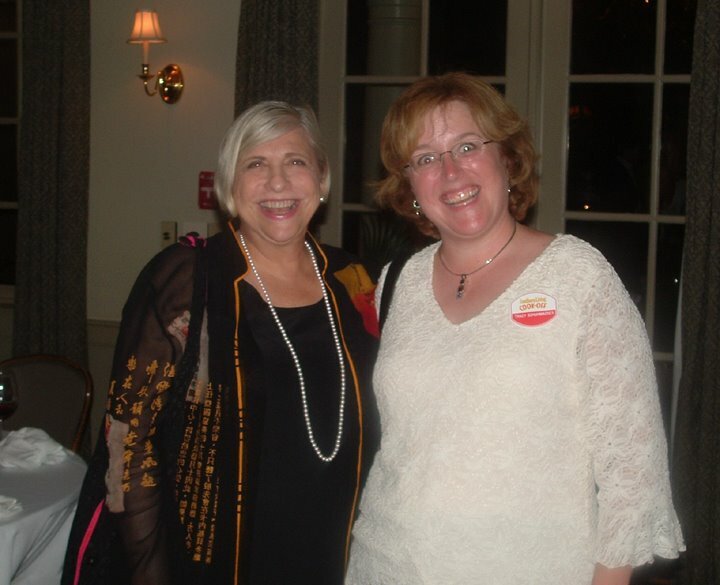 The winner was Karen, who had won a Pillsbury category prize the same year I did. She's done pretty well for herself! 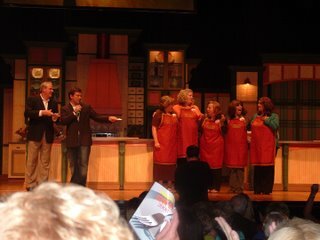 Then the category winners went onstage for the presentation of the $100,000 grand prize. And the winner was ... Mo’s sweet potato cinnamon rolls. We all went on stage for a group photo, and then it was over. On the way out of the Auditorium, I ran into Nathalie Dupree. She asked me to remind her which dish I was mine. The collards, I said. My first reaction to this was disbelief, as I didn’t have a lot of control over the serving dish. But upon further reflection, I think she was telling me that the dish didn’t have a lot of visual appeal. I agree with her and I’m grateful for the feedback. I don’t tend to give a lot of consideration to how dishes look, and I plan to give that more thought in the future. After the show, Southern Living held an after-party at a historic building near the water. Stations of food were set up with various Southern specialties, and there was a live band. It was a fun way to end a great time in Charleston. If you want to see the winning recipes, they are here. All of the finalist recipes will be in the January issue of Southern Living. What a fun experience - sorry you didn't win, but it sounds like you enjoyed yourself! Thanks for sharing your adventure Tracy! I completely would have forgotten everything had Tyler been standing right next to me. I'm glad you had a great time, but sorry you didn't win. I will have to give that risotto a try- sounds wonderful! Tracy you can cook for me anytime!! Congrats on doing what many others only dream about...making it to the finals. What a year! You are inspiring! Joe, by the way, has been a food Blogger for quite some time. The link (Culinary in the Country) is listed at right. I hope to see you next year here in Birmingham.